Ooof! If there’s one thing I love about the colder weather that’s creeping in, it’s getting all cosy with knitwear and so it was without hesitation that as Autumn started showing it’s blustery face I swooped down to the beautiful Bermondsey to take in the latest exhibition at The Fashion and Textile Museum; called KNITWEAR, Chanel to Westwood. I’ve not been to an exhibition at this place which I haven’t adored, it’s the most informal, welcoming and relaxed atmosphere and the size of the exhibition space means that each show is perfectly digestible and you don’t need to spend hours making sure you’ve seen everything there is to see. Although that being said, I get the feeling that staff wouldn’t mind one bit if you fancied lingering the whole day long looking at the fashion on display. Sometimes with the more epic fashion exhibitions at venues such as the V & A, it can be kinda overwhelming and you feel like you need to invest the bulk of your day taking in all the sights and remembering all the information you are learning. Sometimes, that’s great, you wanna loose yourself in a magical exhibition, in an amazing venue for hours and hours, but, there’s a lot to be said for those small and perfectly formed exhibitions in smaller places which can be enjoyed as part of your day rather than as all of it. 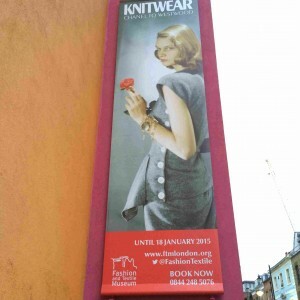 For me, this is where The Fashion and Textile Museum excel. 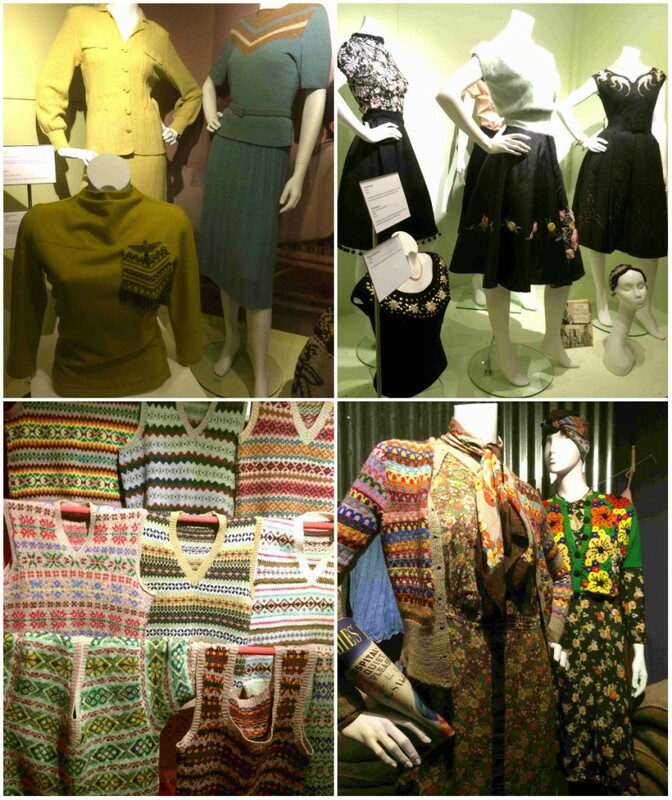 This exhibition was a super display of knitted fashions spanning the last century and, was interestingly predominantly made up of the personal collection of Mark and Cleo Butterfield. It was more a showing off of their vast and spectacular collection than a timeline of knitting, allowing the whole thing to feel slightly more light-heated than historically rigid. 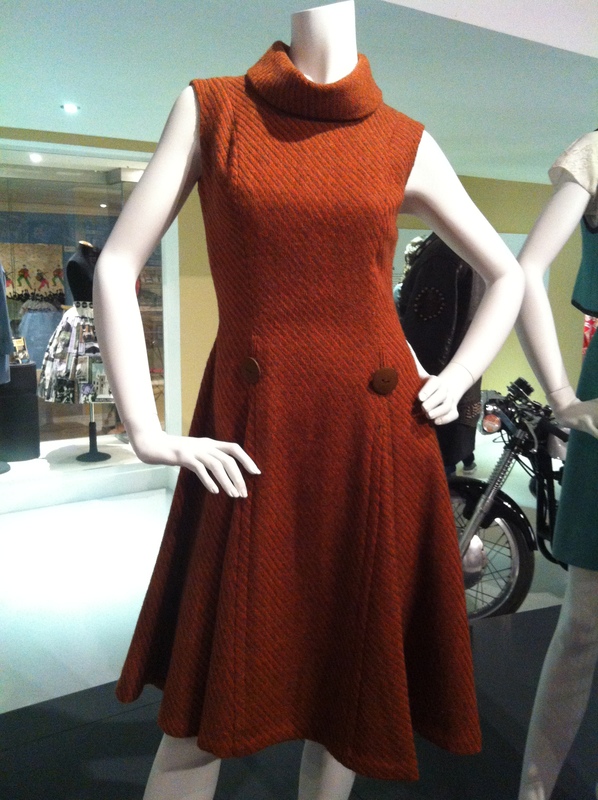 With amaaaazing examples on show, we get to see the journey of knitwear; it’s early use for warmth and function, knitted swimwear and evening dresses of the 1920’s, the ‘make do and mend’ trend for unravelling jumpers to use the yarn again, embellished angora sweaters from the 50’s, futuristic knits from the likes of Couregges in the 60’s, novelty and folklore knits in the 70’s and the experimental bold knitwear from the 80’s! This exhibition is thorough without being too heavy and you get a really good grasp of knitwear and it’s past, there’s plenty to swoon over, especially, for me, the 1920’s fine knit gowns! The layout was a bit dark for me, the displays were sectioned into large wooden shipping crates, with some piled two high so it pulled the small space in quite close and felt a bit gloomy, but, the actual garments themselves were all pretty well lit and what I always like about this place is you can peep your eyes up real close to the displays and see every stitch! A gorgeous exhibition that leaves me gasping to get a look at more of Cleo and Marks incredibly large private collection of vintage fashion….. making mine just seem teeny in comparison. 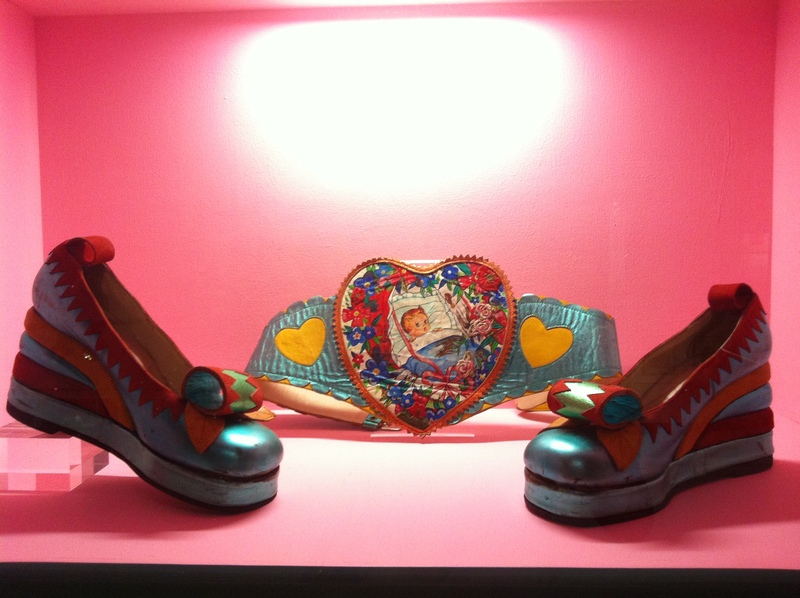 All sorts of excitement were inside my tummy when, a few weeks ago, I scooted off again to my most favourite fashion museum. 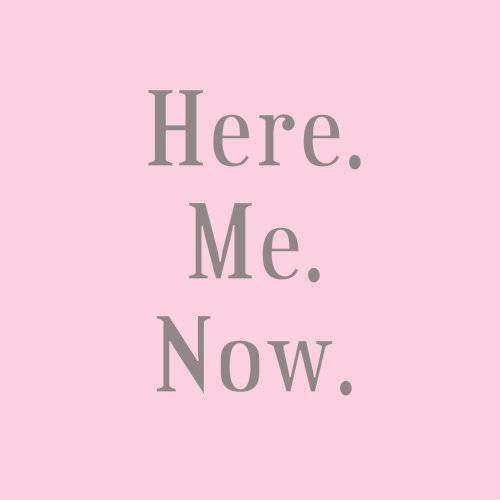 Yep, I go there as often as possible and when I saw a chance to attend one of their small and personal Couture Handling afternoons….I whooped out loud and booked myself a space. Happy girl. They do this event every now and again and it’s basically a small group of people getting the lucky chance to touch, feel and examine the museum’s handling collection from the archives. Because of my vocation in life, I do handle vintage beauties on a daily basis, including a few designer and couture pieces, but, I never shy away from the chance to touch some more, and especially if it’s ALL couture! Hosted by Dennis Nothdruft, the museum’s very lovely and extremely knowledgeable curator; we got a conference room, him and the garments all to ourselves for the afternoon; and a pair of white gloves each so we could freely caress the items. We looked at coats, dresses, suits and jackets and were able to ask all the questions we wanted. 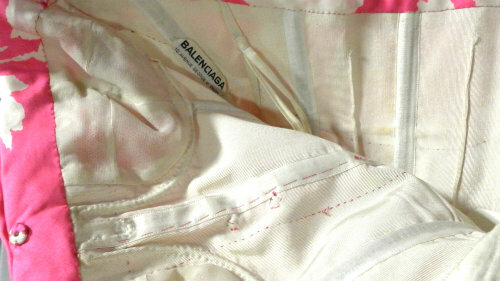 As a vintage dealer I am well aware that used fashion often has marks and damage from age and wear. It was really refreshing to see that the museum held items in it’s archives that were stained or marked but still deemed them as great examples. This issue is something that I continually have to explain to some people unfamiliar with vintage; the items have lived a life and are older than you are, so will invariably have signs of their journey, it doesn’t make them any less fascinating or adorable. As with all the events at this place, it was relaxed and informal with the small group of us all mutually ooh-ing and aah-ing at what we were seeing. One lady did, to everyone’s horror, proceed to pull out a packet of crisps to eat whilst we were stroking Halle Berry’s actual won-an-Oscar-in-it gown, but apart from that, it was a gorgeous, fun, educational and privileged way to spend some time. 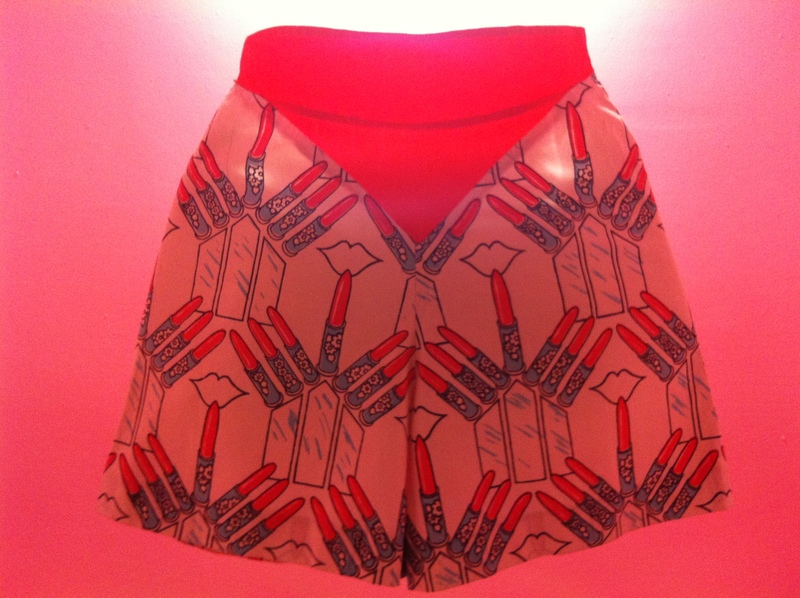 Haute Couture; it’s pretty special. In fashion, it doesn’t get any higher. A term first used to refer to the work of designer Charles Frederick Worth, it began in the mid 19th century. Worth was the first dress maker to create bespoke designs that customers could choose from and have made to their own measurements in their choice of quality fabric. 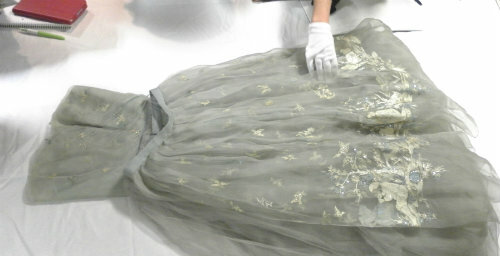 Known more often as just Couture, this was the form of fashion which turned dress makers into artists and creators. 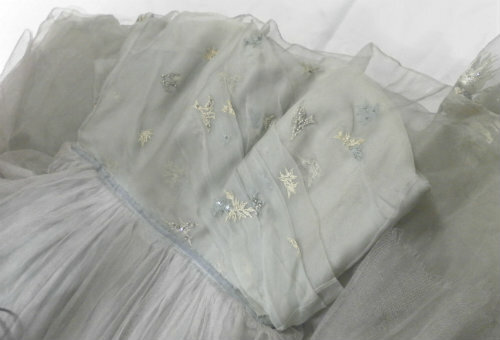 Always using the most exquisite fabrics and trims, made by the most skilled seamstresses, using time taking techniques and with lavish detail and embellishment. The name referred to fashion made in Paris- where it had strict rules as to what could be deemed as couture- whilst in London it was still being referred to as ‘custom made’. 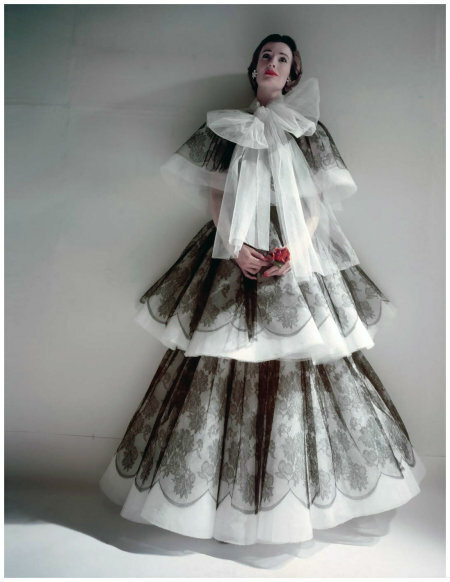 The notion of couture eventually spread to London, Rome and Milan. Chanel, Dior, Balenciaga, Lanvin and Vionnet all followed in Worth’s footsteps to become well-known for producing exquisite haute couture. Today, only a few of the very large design houses still create couture; with their ready to wear, accessories, make-up and fragrances creating the mass volume of their sales. It was Dior who first started the whole idea of licensing products such as perfumes and make-up under his name, enabling the mainstream to buy into his brand, in effect, he changed the way the fashion world worked forever. 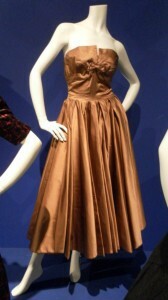 The first two dresses we looked at were both Christian Dior, and my goodness they were sublime. 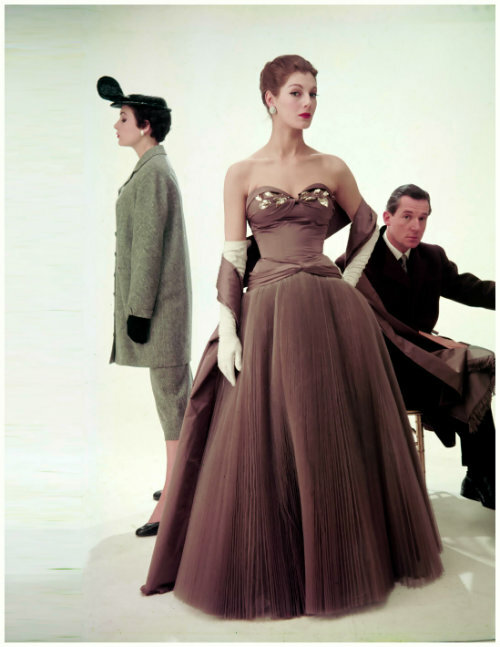 Having created the New Look silhouette in 1947, Dior was then quite possibly the biggest name in Parisian fashion until his early death in 1957. 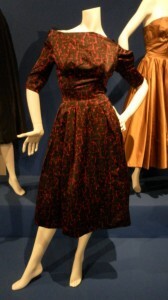 The two dresses we looked at were such beautifully typical pieces from him, cinched-in waists and full bodied skirts, so feminine and curve creating. 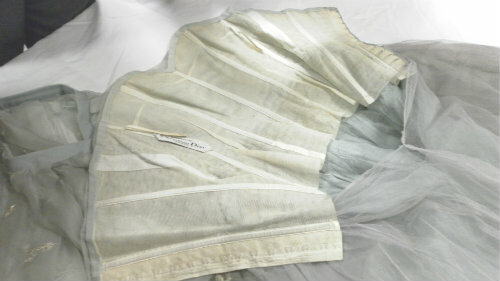 As with much of Dior’s early work, both these ‘dresses’ were in fact 2 pieces; a skirt and a bodice. Both dresses we looked at were teeny and had been gifted to the museum by their owner, who was a member of the famous ‘Heinz’ family. 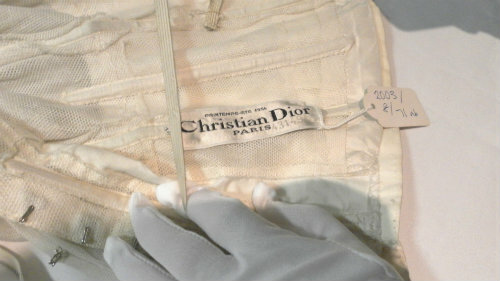 All of Dior’s couture has a label with a serial number and a date on. 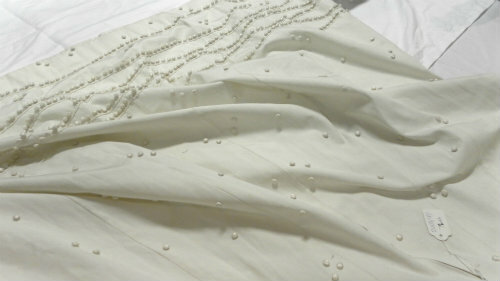 The first dress, a white 2 piece was from Spring/Summer 1954 and had the most adorable stitched on little baubles. Both dresses had the underskirt attached to the bodice, made of tulle with a horsehair hem, and then the actual skirt goes over the top. 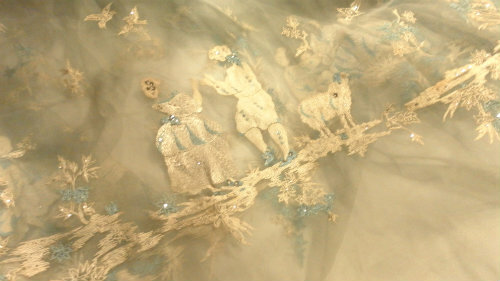 The pale blue silk chiffon dress was to die for, stunning pleated bodice and the most intricate shepherd scene embroidered all around the skirt. 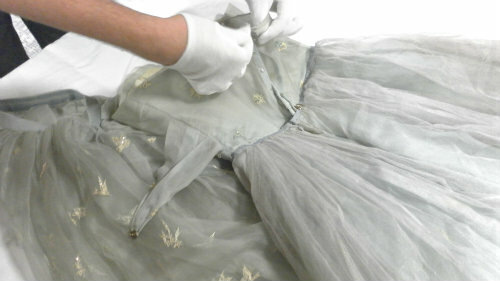 This ‘Rococo style’ dress was dated 1957 and was part of Dior’s last ever collection. 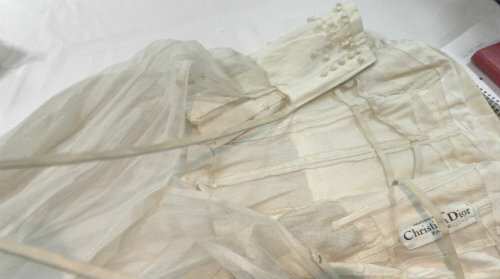 We also got our gloved hands on a classic cream wool skirt suit from Chanel. Having been in the fashion industry for over thirty years, Coco Chanel decided, after World War two, that women needed to step away from the corseted and restrictive ‘New Look’ which had been favoured and designed by men. 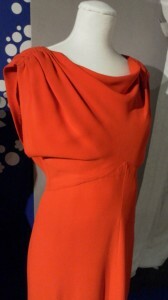 So she created a look that was the complete opposite; loose, boxy and with sportive elements. 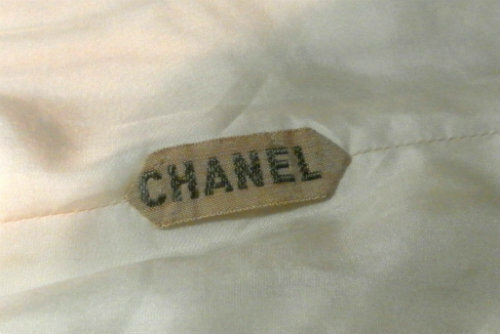 Chanel is undoubtedly most famous for her suits. 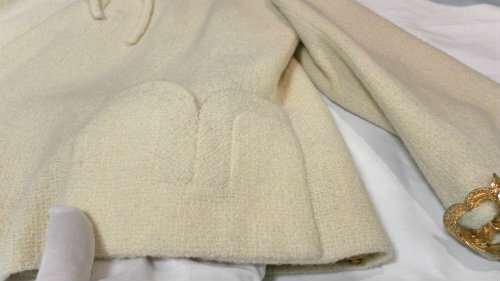 This cream one was in great condition and had a real weight to it, the chunky gold chain on the inside hem of the jacket is a classic Chanel element and the gold chain trim on the cuffs and neck were stunning. Looking in detail at couture makes you realise just how much painstaking work goes into each garment, like with all great vintage pieces the attention to detail and the precise workmanship is way beyond that which you would see in clothing today. 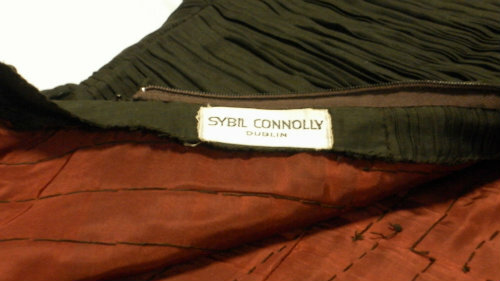 One amazing dress we looked at was a Sybil Connolly one from the 1960’s. 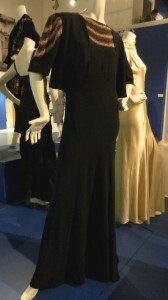 This full length black linen dress had been horizontally pleated by hand, with all the work clear to see on the inside, stunning. 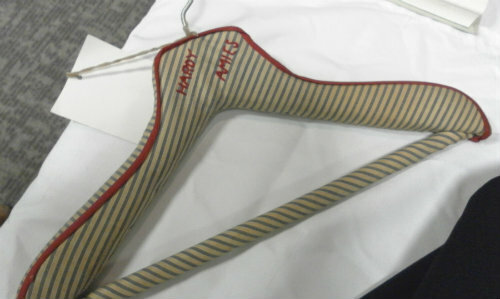 This was the cutest and most probably pretty rare original Hardy Amies hanger. Couture items that didn’t eventually sell would be moved into a showroom of the designer and become ready-to-wear garments, with one free fitting to whoever purchased it, kinda like a modern day outlet store! 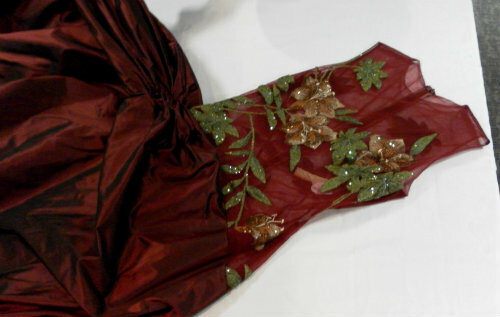 A Hartnell dress would get a ‘Le Petit Salon’ label to identify that it had originally been couture. 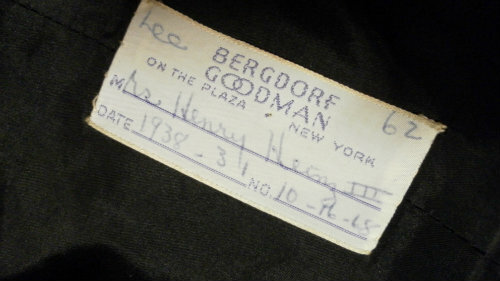 Designers also sold the pattern of a couture item to a customer who would then take it home and get the item made up in the fabric of their choice by a dressmaker, that item would then get a label from the dressmaker or shop which made it up, like this one from Bergdorf Goodman. This fuchsia pink silk Balenciaga dress was beautiful, from 1967-68, this had a tropical feel and a Balinese influence, beautiful corset, but from the outside draped like a sarong. With this dress you can again see the intricate and precise work; the hand stitched over-locking on the inner seams was incredible. The most modern dress we got to stroke was the gorgeous burgundy dress by Elie Saab, worn famously by Halle Berry in 2002 when she won her Oscar. 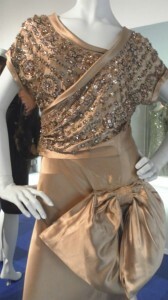 This dress was opulence itself, the weighty luxurious skirt and the delicate sparkly embroidery made me melt. If left alone in a room with it I would slip right on into it and do a little imaginary red carpet saunter. Well, given half the chance I would have tried on every single one of those dresses. The perfect thing about all the vintage dresses I work with myself, is that I can indeed pop them on for a moment and feel pretty damn special. 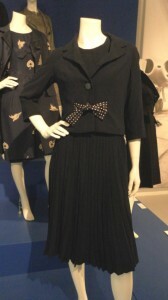 Fashion & Textile Museum website. Haute Couture; the very best of dressmaking, the very finest of fabrics, the most specific tailoring, the most intricate embellishment, the most beautiful fashion in the world. 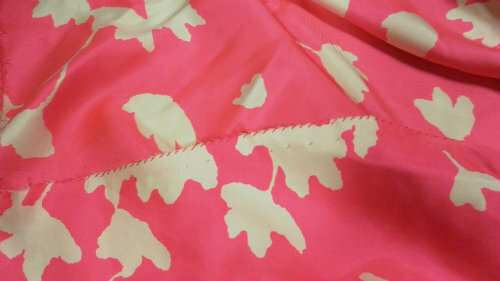 As a girl whose heart beats faster at the sight of a well-made dress, it doesn’t get much better than this. One of my all time favourite places has an utterly divine exhibition on at the moment and I got my peepers on it last week. 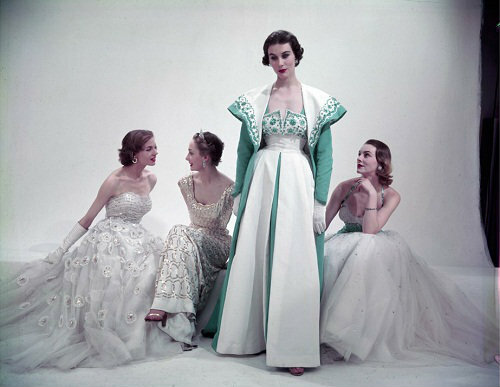 ‘Hartnell to Amies, Couture by Royal appointment’, is just perfect. The Fashion and Textile Museum, as always, is a great place to see an exhibition, great size, relaxed atmosphere, and always impeccably curated, on this occasion by Dennis Nothdruft and Michael Pick. 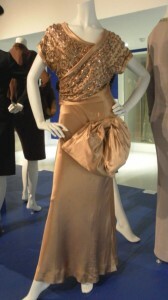 This darling of a show focuses on the undisputed Kings of British vintage couture; Norman Hartnell and Hardy Amies. With a stunning selection of their work, displayed beautifully and with great informative text alongside. 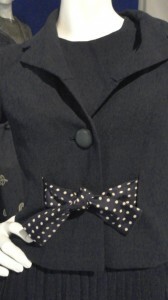 We also get to see examples of hat couturier Frederick Fox. In addition to all this gorgeousness, we are treated to the sights of some other couture pieces including Worth, Digby Morton and Lachasse. 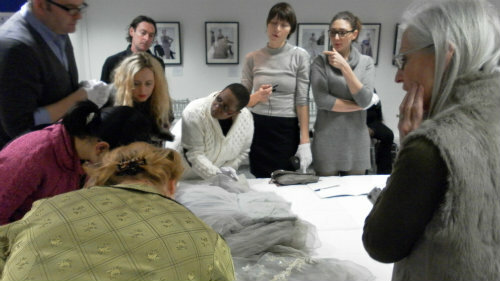 It is always an absolute treat to see the fashion up close, to study the detail and craftsmanship. 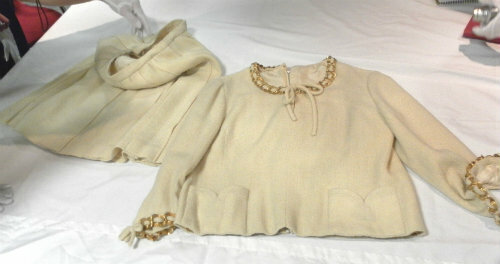 As a vintage shop owner, I am lucky enough to come across couture pieces myself. 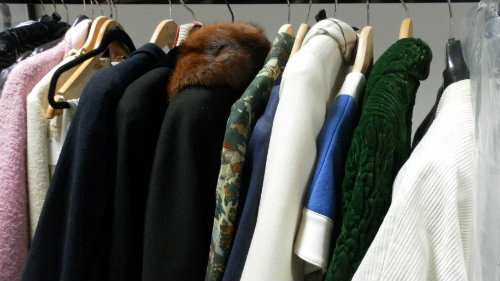 I currently have dresses by Hardy Amies, Lachasse and Worth in my collection which I love and will blog about separately. 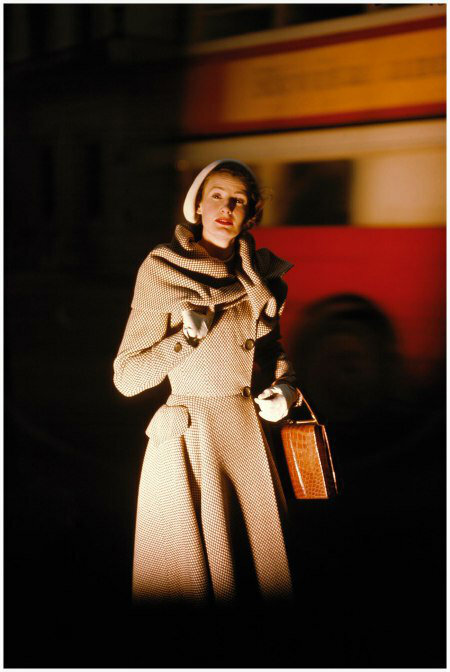 These photographs above are a few of my favourite from the work of infamous couture photographer, Norman Parkinson, beautiful. 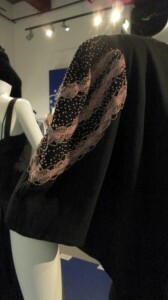 I did take some photos whilst at the show, not great but a bit of a glimpse at my pick of what was on display. 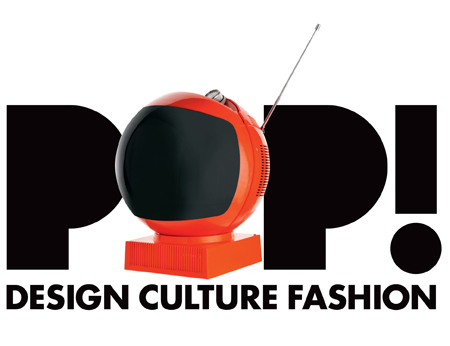 I merrily swooshed down to my most favourite place, the Fashion and Textile Museum in Bermondsey for the opening day of their new exhibition POP! 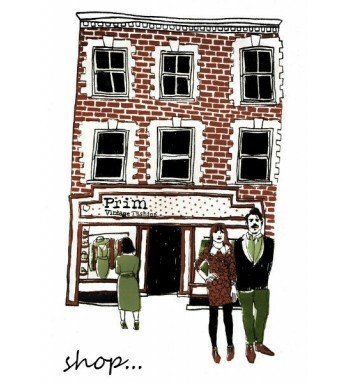 I adore this place, it’s a great size and it has a really genuine, informal vibe. 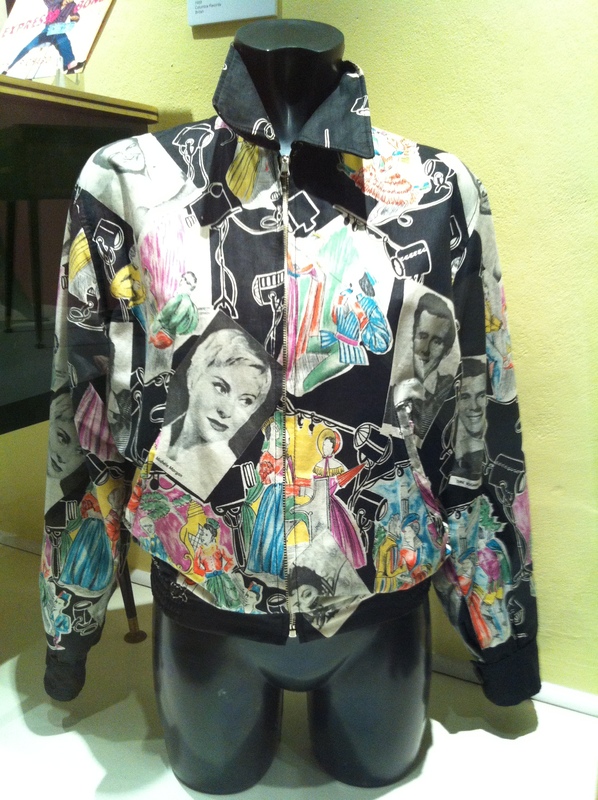 This latest exhibition has been curated to perfection by Dennis Nothdruft, of the Fashion and Textile Museum, with guest curators Richard Chamberlain and Geoffrey Rayner of Target Gallery. 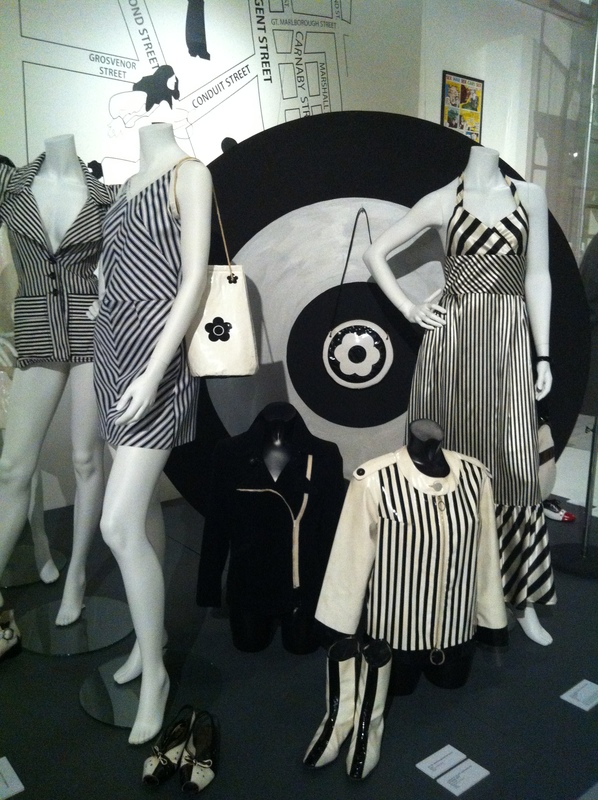 The exhibition takes a good look at the way music, art and celebrities from the late 1940’s to the late 1970’s influenced fashion, as well as attitudes, ideals and desires. It takes us from the glee of Rock ‘n’ Roll through to anarchic Punk Rock, via, Mod, Psychedelia, and Kitsch. As usual with this lovely place, the exhibition is a visual delight! It’s been displayed so beautifully and precisely, the sleek Mods, the black and white of Quant, the neons of the Psychedelic; it’s glorious to say the least. 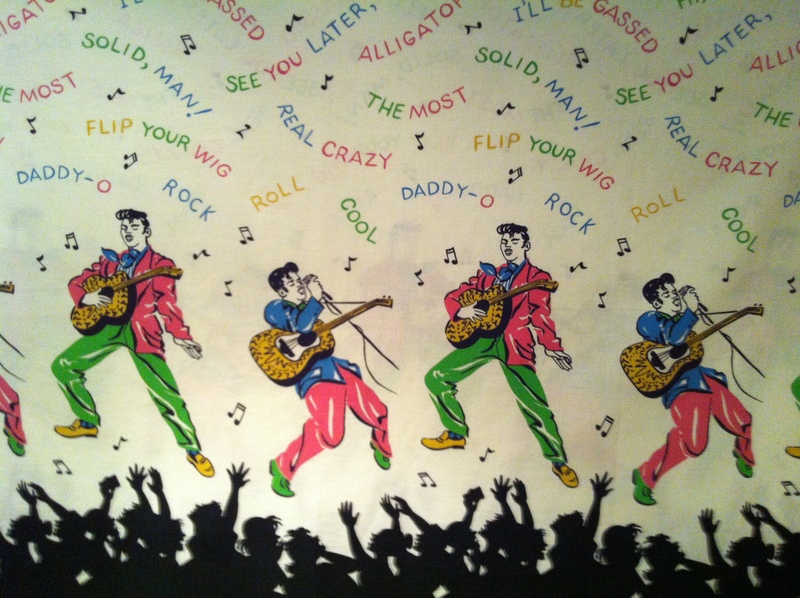 Skirt fabric for Elvis fans, 1956. 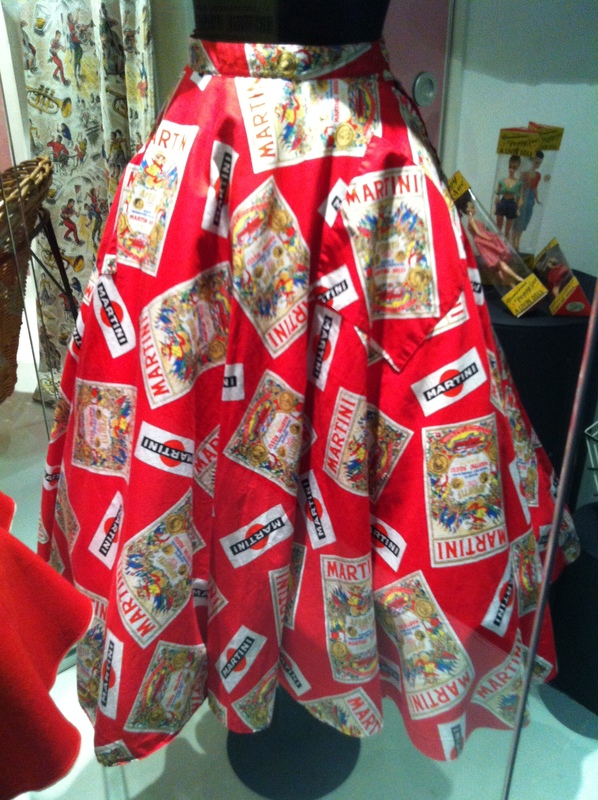 I love this Martini skirt, which demonstrates the early use of commercial advertising as a decorative form, it’s gooorgeous! 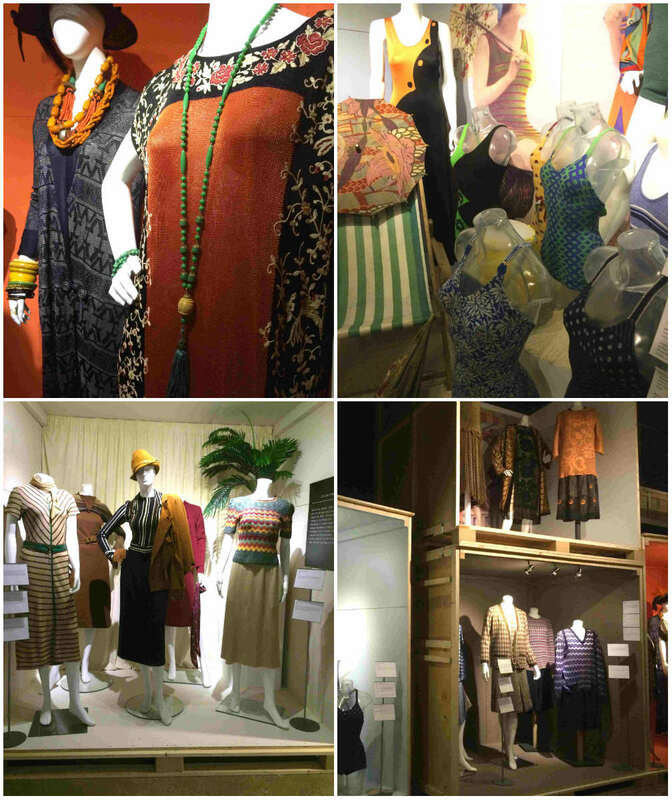 The exhibition has fashion and home wares from each era as well as some cute quirky pieces of consumer goodies. 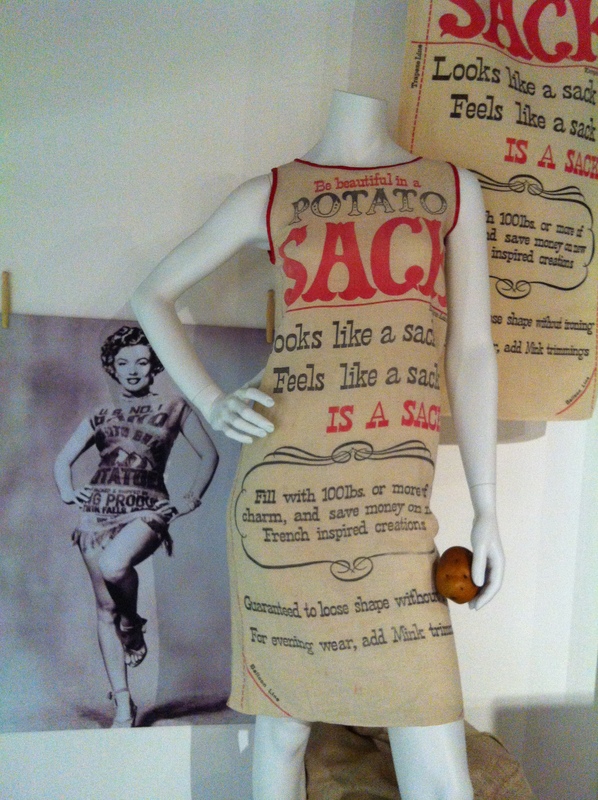 This sack dress is ace, a witty satire of Pierre Cardin’s radical Sac dress from the 50’s, implying that anything can be turned into fashion. 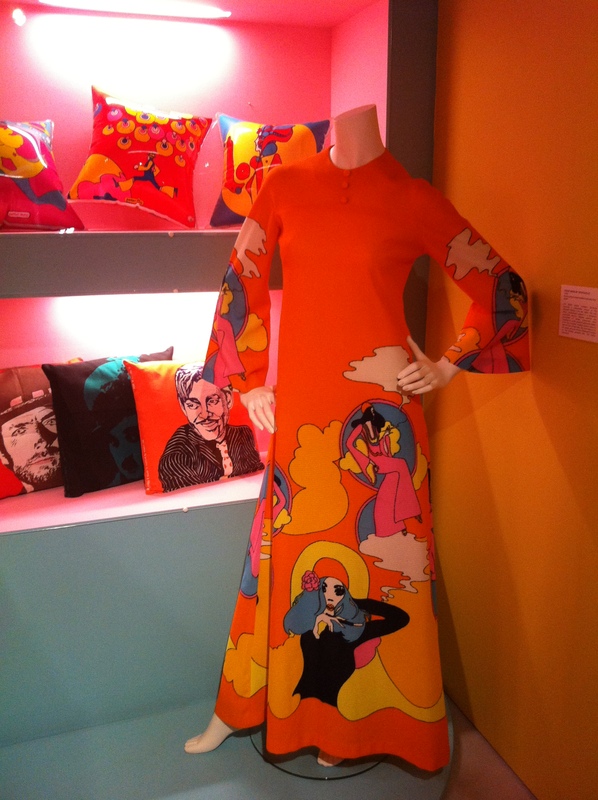 My favourite bit was the late 60’s, early 70’s kitsch and cartoony part of the exhibition, great to see some prints from Zandra Rhodes in there too! 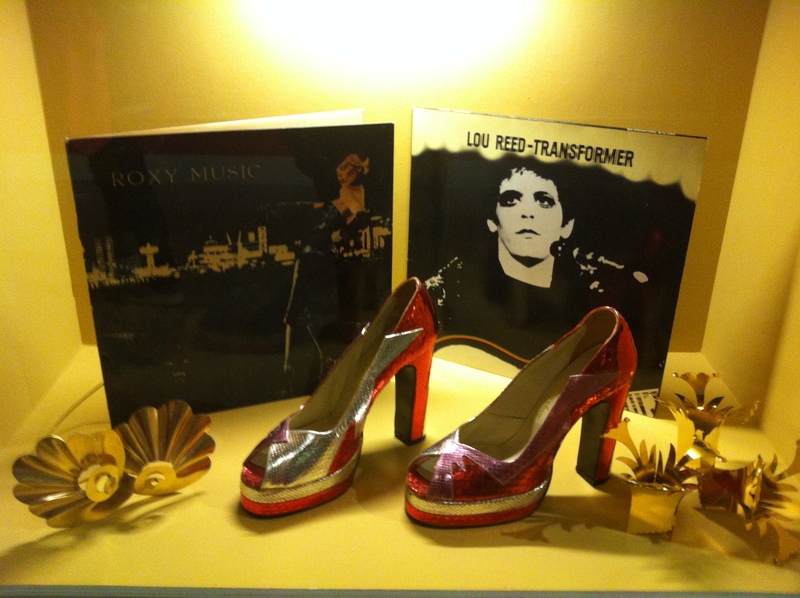 Wedge shoes and belt by Mr Freedom, 1970. 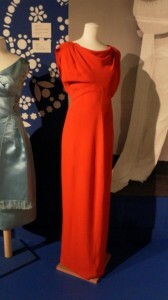 Cruise Dress by Sportaville, 1969. Terry De Havilland snakeskin platform peep-toe shoes, 1971. 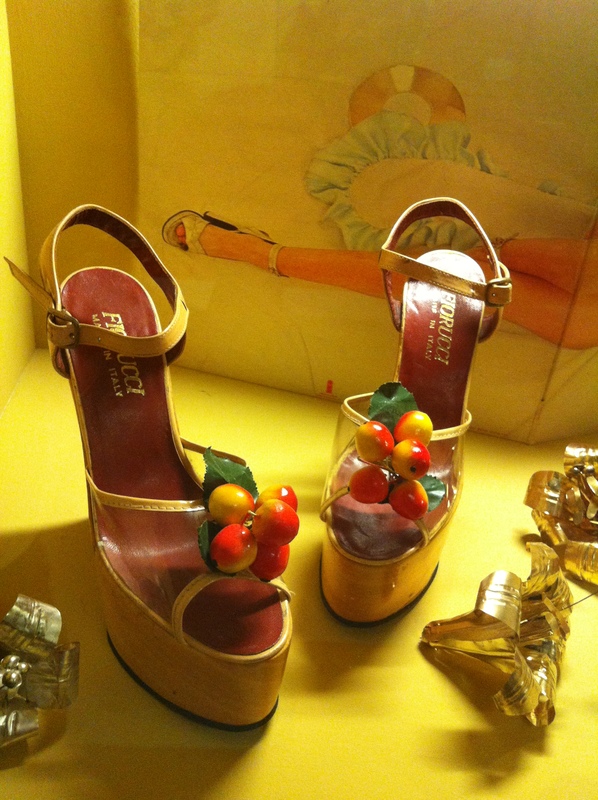 Fiorucci ‘Cherries’ platform sandals, 1971. This Pop! 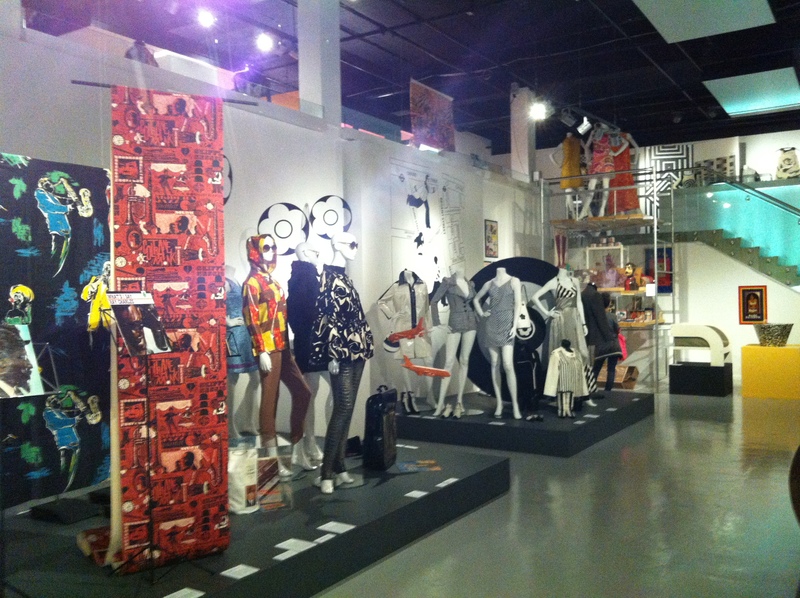 exhibition sure does make your eyes pop, it’s so startlingly colourful and effervescent, and translates magically the potent influence that modern popular culture had on the designs of fashion. So much to look at, loads of classic iconic pieces to gaze at as well as loads of cute unusual discoveries too, pop along and give your eyes a feast!